Do Bong Soon, is an unique woman as she describes herself, since she has an extraordinary force that allows her to destroy objects and kick asses at a superhero level, although this power causes confusion within her because she can not use it openly and have to keep it secret even in situations that warrant her intervention, an unfortunate incident, makes his powers known to the quirky director of a video game company, Ahn Min Hyuk, he believes that Bong Soon is the perfect person to take care of his safety, because he has recently been the victim of anonymous threats and follow-up by strangers. 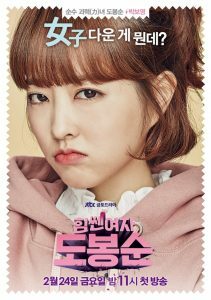 This witty working relationship will gradually take on a romantic twist that will give way to an interesting and fun love triangle, considering Do Bong-soon has always been in love with her childhood friend, In Gook-du. Do Bong-soon, is an adorable girl, sweet, with a great sense of justice, but with an innate ability to get into trouble, her special power, comes from her family heritage, a power that only passes through women. In addition, her greatest dream is to create a game where she is the main protagonist, this is why she accepts a new job as a bodyguard of Min Hyuk, as this will give her the opportunity to be part of the planning department of his video game company if she succeeds in her job. Director of his own video game company “Ainsoft”, son of President Ahn Chool Do of the Ohsung Group, a very powerful family. He is an intelligent, reckless, charming and money-wasting CEO, who loves clothes and video games, his hatred for the police does not allow him to trust them to deal with the dangerous threats he has been receiving, so he resorts to the sweet but super strong help of Do Bong Soon. 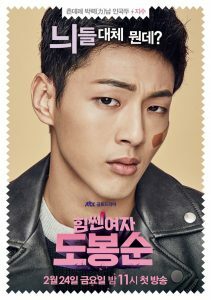 A member of the Do Bong Police Station Crime Team 3, Gook Doo is a rookie but dedicated policeman, a friend of Do Bong-soon’s family since childhood, and he doesn’t have a clue that she’s been in love with him since 6th grade and treats her a little coldly. Gook Doo develops a great rivalry with Min Hyuk for the peculiar working relationship he has with his close friend. The beginning of this adorable couple comes when Bong Soon rides her bike and stops to help a preschool bus driver who is being attacked by a thug, following this, a mob of thugs attacks Bong Soon, but she finishes them completely by means of her incomparable force. While this fight takes place, Min Hyuk, that happens to be nearby, sees how Bong Soon sweeps away all these criminals, this leads him to speak in her favor at the police station and tries to convince Do Bong Soon to work for him, offering her a juicy sum of money and the opportunity to fulfill her dream: To make her own video game with her as a protagonist. 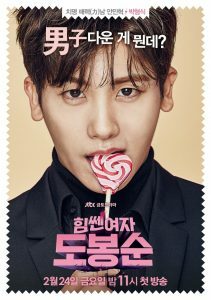 Throughout the development of the story, there are two different scenarios, in one we see how Do Bong Soon and Min Hyuk try by all means to find out and stop who is to blame for the CEO’s life is in constant danger, but whose search will bring them many consequences and an unexpected disappointment. Meanwhile, in the neighborhood where Bong Soon lives, there is the horrible murder of a single woman whose investigation is blocked by the lack of evidence. 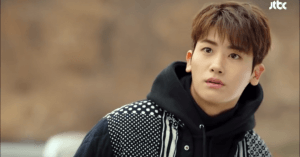 However, the mysterious murderer attacks again and Bong Soon is a very important witness who is in grave danger, this is why Gook Doo tries to protect her, this gives way to a wave of events and crimes in which this girl and the entire department of the police station of Do Bong seeks to stop the culprit. 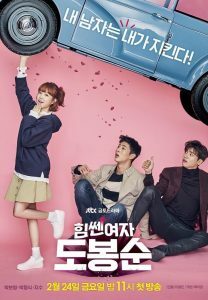 This curious story that involves drama, comedy, fantasy, suspense, and romance, may have surprised all fans of K-Drama, as it was not expected to be so popular, is a super fun drama, in which the scenes where Bong Soon is kicking everyone’s asses are to die laughing, not to mention that her family is not boring at all, to this we have to add the perfect and wonderful chemistry that there is between Park Bo Young and her co-protagonist Park Hyung Sik, which gave all the romantic scenes a dose of love and some very real kisses, that much that love crossed the screen, Park Hyung Sik confessed in an interview his love for Park Bo Young, saying that one of the reasons why he accepted the role was because his co-star was her and to the joy of Strong Women Do Bong Soon fans she reciprocated his affections. The love triangle that unfolds along the plot is very funny and drives us to decide which side to pick, between the eccentric CEO and the manly and protective Police officer. The suspense and mystery scenes were acceptable, nothing for an Oscar but they keep the audience interested and with expectation on what was going to happen next. The end somewhat dramatic and exaggerated, but, what can we do. On the other side, in some point of the story Bong Soon losses her powers, the way she regained her powers may seem a bit cliche and overuse, but, let us remember this is not a serious, realistic drama, besides the way she regained her powers was somehow poetic like (you will understand it when you see it). The character of the villain in this drama is substantial, brings all the fear and suspense, as you see him, you just know that Bong Soon will eventually face him. He has a crazy obsession for the play “Barba blue and his seven wifes” and tries, by all means, to turn it into reality… his reality, by means of hunting and murdering women. Plagued with the memories of a childhood filled with physical abuse from his mother, this total psycho will continue to elude the police again and again until Bong Soon puts an end to his villainy in a superpower girl way. Guilty pleasure. I loved it! Finally, the Strong Woman Do Bong-soo OST is very sweet and gave the final touch for the scenes of Bong-soo and Min Hyuk kissing, I’ll leave a link if you want to listen to it, like right here. Previous article“100 Days My Prince” cast celebrates audience increse with a dance.